View the full size hi-res image. It’s the perfect way to start a Starwirbel! We’re going to use it in the upcoming Starwirbel Way class this July. (CGOA Chain Link conference this July in Portland, Oregon). For this unusual stitch, two foundation chains must be created as you complete each star. In the text instructions below, a [bracketed number] refers to a numbered photo step above. [image #1] Pull up a loop in each of the second and third chains; you have 3 loops on your hook. Chain 1 (eye of this first fstar). Tips: Pinching also helps you recognize which loops are the new foundation chain loops. Pull up loops loosely enough that a second crochet hook could fit in them. Repeat from * for each new fstar. You might be interested in the resources page for the Starwirbel Way class. I’ve moved to WordPress hosting with layered security and a WooCommerce-driven shop. For me it’s like the self-parking Lexus of websites, and I’m saving about $500 a year in operating costs. Also, blogging is fun again! It’s now free. Use it to make any thick, dense, soft, strong rectangular item (cowl, afghan square, tote, hot pad, etc). It’s a partial list—I keep discovering more features. I can easily host free crochet patterns now! I’ve marked down some patterns to free. (They’re not marked down in Ravelry). You can see them in the Bargain Bin but wait: try registering an account here first (you don’t have to buy anything). I think it’s a really nice experience, especially after you download something and then use your updated account. Subscribe to the blog or its RSS in the footer (scroll to the bottom of this page). Lots of clickable tags on each product page for any little feature you might want to see. For example, “Gift idea: men“, patterns that work for any type and/or amount of yarn, one ball projects, etc. Scroll to the bottom of any page to see the product tag cloud. Helpful things in the right sidebar on every page. On mobile I think these are behind a menu button in the top right corner. The expanded help page is a mini temporary version of the real FAQ page that I’m working on. If you’re already familiar with my patterns, it’s not your imagination: most images and descriptions are also freshened up. Another simple crochet pattern, now free. I used Jelly Yarn® and I would do it again—with the glow in the dark type! Work out how to add more types of kits to the shop. 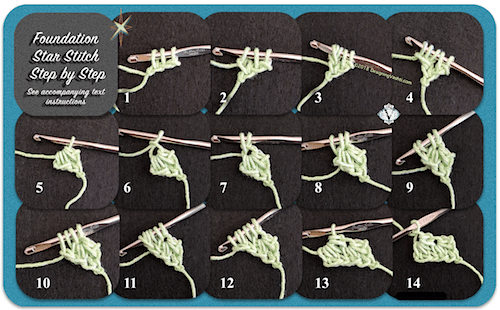 Learn how to include optional add-ons, like gift wrap or a crochet hook to go with a pattern. Add remaining patterns from my old shop, mostly toys and bags. I also haven’t finished adding free patterns. Choose the best way to organize/nest all the crochet tutorials and other resource pages. I’m eyeing the “Learn” tab in the header. Learn how to do gift cards. Find a good way to do online classes and other events. Love Knot+Star Stitch Scarf: New Pattern! 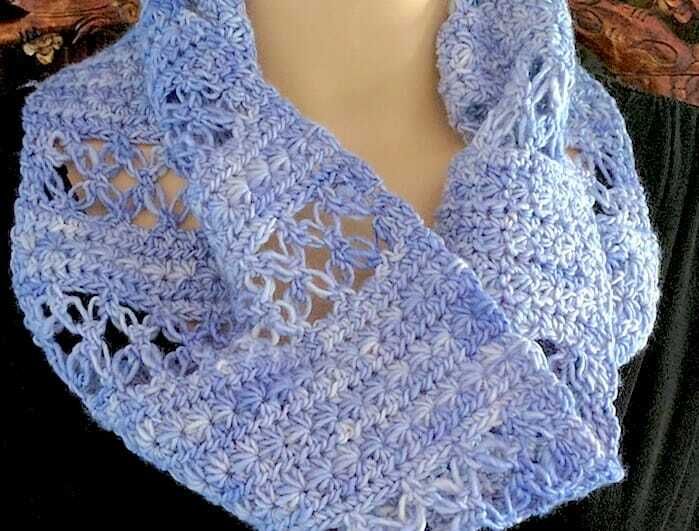 A star stitch crochet scarf with love knots? (About as common as a love knot scarf with star stitches.) So beautiful together! I’m calling it Lovelace Ring Scarf. UPDATE: Lovelace pattern is now in the Designingvashti Shop and Ravelry. Why Star Stitches With Love Knots? The Story. I first swatched it in 2014 for CGOA classes I would be teaching: A Star Stitch for Every Purpose (3 hours) and 21st Century Love Knot Adventures (3 hours). Back then I had to set it aside due to stitch compatibility issues. You might be able to see some of this in this first swatch. Two years later a visitor to the DesigningVashti Facebook page requested the pattern. Again in deep crochet class prep mode, I had to put it off until after teaching and a series of seven crochet tutorials I’d agreed to do for the Cut Out & Keep site. Alternate yarn idea: Love knots and star stitches both benefit when crocheted with two yarn strands held together. This is Satin Grey Lotus yarn with a lace weight metallic mohair. By then the US election had just taken place. I appreciated the sweet, loving patterns crochet and knit designers were spontaneously posting. I returned to the 2014 attempts to blend stars and love knots in one pattern. It was a pleasure to finally polish it up into a fun, versatile, balanced stitch pattern. I hoped the idea of harmonizing and unifying two popular stitches of very different traditions might lift others’ spirits. The basic stitch pattern is available here. I used it to make a 6.5″ square block with DK weight yarn and a G7/4.5 mm hook. A border would probably turn it into a 7″ block. The Lovelace Ring Scarf design happened next because I needed a self-edging version. It came to me during Thanksgiving. As I lay there contemplating the stitch pattern I’d sent off to Cut Out & Keep, I wondered about giving the basic stitch pattern a selvage (no need to edge it later). The start and end of the love knot section always looked a bit stringy and unstable to me. I also wanted to vary the texture bands and widen it for a lush, romantic ring scarf. This is how Lovelace came to be. Both are Intermediate-level crochet stitches but that doesn’t mean they’re difficult. I include tips and visual aids in the pattern that have worked in my classes. Most of Lovelace is rows of easy, familiar stitches like single and half double crochets (sc and hdc, or as they say in the UK: dc and htr). These easy stitches are a backdrop to the fancy stitches. Like peacekeeping diplomats they harmonize relations between the two iconic, culturally powerful, individualistic “diva” stitches. My experience of crocheting star stitches (stars) and love knots (LK) in the same pattern is that I get some comfort zone rows of simple stitches, then a spicy row or two, then more comfort zone. I researched both of these two unique stitches deeply. I don’t recall ever seeing them combined in one stitch pattern. If you have, please let me know in the comments. Love knots are reversible, star stitches are not. It was an issue with my early swatches. Love knots are more independent than the usual crochet stitch, and star stitches are the other extreme. This shows in lots of ways. Add Love Knots anywhere like a chain stitch because it’s a type of foundation stitch. Each LK is distinct, complete, and recognizable from a distance. Star stitches require context. The stitch just before it, after it, and often above it determine how recognizable each star is! Love knots likely originated as a southern lace, star stitches as a northern thermal fabric. LK were almost always crocheted in very fine cotton and silk threads for delicate and summery edgings, baby bonnets, and petite “opera bags”. Both LK and stars are romantic, iconic, classic/old-fashioned, popular, and beloved. Both originated in the early to mid-1800’s. Both can be lacy. When star stitches are lacy, you’re looking at pulled loops, just like with LK. Both start the same odd, non-intuitive way. I did a newsletter issue on it: “Starting a Stitch with a Backtrack“. Crocheting them with two or more strands of yarn held together enhances their distinctive textures. Hmm. Double or triple the width of Lovelace to make a stunning shrug or wrap!